The Louisville Leopards Boys Varsity Basketball Team defeated the Walsh Jesuit Warriors 47-36 in the opening game of the Greynolds Classic at Barberton High School Saturday Afternoon. With the victory, Louisville improves to 3-2 on the season. Scotty Gronow made 3 of his 4 three-pointers in the opening quarter and led the Leopards with a game-high 14 points. Colton Jones also made 3 of Louisville’s 9 makes from beyond on the arch and scored 9. Spencer Hall and Cam King also added 7 points each for LHS. 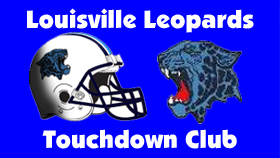 The two teams lit up the scoreboard for 36 points in the opening quarter which saw the Leopards take a 19-17 advantage. Only 11 points were scored in the second period as the Warriors snatched a 24-23 lead at the break. Louisville reclaimed their advantage 32-31 at the end of three and then outscored Walsh 15-5 in the final stanza to earn the double digit victory. The Warriors were led by Ross who made 3 triples and scored a team-high 13. Stern also scored 8 and Cottrel added 7. UP NEXT: The Leopards will next host the Akron Firestone Falcons on Saturday, December 15. JV begins at 6:00 PM and Varsity follows at 7:30 PM from LHS. The Louisville JV Team will also host the Massillon Tigers on Tuesday, December 11 at 6:30 PM. LEOPARDS: Gronow 5 0-0 14, Jones 3 0-0 9, Hall 2 3-4 7, King 3 0-0 7, Chambers 1 0-0 3, Pukys 1 1-3 3, Mathie 1 0-0 2, Noble 1 0-0 2. TOTAL 17 4-7 47. WARRIORS: Ross 4 2-2 13, Stern 2 3-5 8, Cottrel 3 0-0 7, Commings 2 0-0 4, Morris 1 0-0 2, Venneri 1 0-0 2. TOTAL 13 5-7 36.